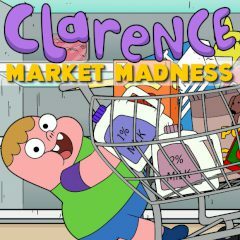 Clarence has a lot of things in his grocery list. do everything fast and load the shopping cart with the products you need. Make sure you won't do mistakes during the run! Clarence has not much time left, but he needs to make all the purchases quickly, because his mom is waiting. Look in the grocery list and find all products you need. Don't make a mistake, or it will cost you one life. When you make three mistakes the game will be over.